Excerpt: Occasionally, I will catch a glimpse of microscopy in headline news that relates to fundamental topics that have been taught in virtually every introductory microscopy course at McCrone Research Institute since 1960. It often involves a new discovery related to one of the laws, theories, or rules that provide guidance when it comes to our understanding of physical optics or optical crystallography. I remember in 2000, after having taught the law of refraction (Snell’s Law) for many years and repeating its claims several hundred times, reading about ‘negative (refractive) index’ materials. When light entering such a substance refracts, the propagation direction of the refracted ray is on the same side of the surface normal as the incident ray. ‘What?’ you say. ‘That is not correct. Refractive index is always positive.’ Turns out, it is possible, and certain materials can have a negative refractive index. Of course, they have to be artificially engineered and contain nanostructures, i.e., some kind of metallic, nanoscopic, electromagnetic resonators. But this is not usually the case in nature or the classroom. Abstract: Hundreds of thousands of miles of asbestos-cement (AC) pipe were installed in water systems throughout the world, especially during the 1960s and 1970s, and many are still in use. AC pipes are also used as telephone ducts, cable conduits, and warm-air heating ducts. The pipes contain from 10% to 25% asbestos by weight. The major U.S. manufacturers combined chrysotile and crocidolite asbestos in their formulations. With the aid of low magnification microscopy, the blue crocidolite fibers can easily be seen mixed with white chrysotile fibers on the surfaces of the pipe. Scanning electron microscopy (SEM) analyses of dust released when touching AC pipe surfaces show asbestos fibers are released during handling of the pipe. Polarized light microscopy (PLM) analyses found 10% to 35% chrysotile and <1% to 15% crocidolite by volume in various samples of AC pipe. A review of several groups of studies — including those by the authors in which standard phase contrast microscopy (PCM) was used to test air samples collected while individuals worked with AC pipe — showed a range of concentrations from below detection to more than 100 fibers per cubic centimeter (F/cc) of air, depending on the tasks. The highest levels were associated with cutting AC pipe with power saws. Levels from 0.2 to 196 F/cc were found when reviewing studies of drilling and cutting AC boards and from non-detectable to 1.1 F/cc for handling boards such as dismantling roofs and stacking sheets. 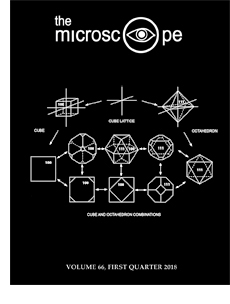 Abstract: The angularity of the shapes of particles and fibers encountered in several fields of application has been the subject of many papers and a diverse set of measurement approaches. Representative examples of different methods are shown. A new approach that offers a potential advantage of computational efficiency is presented, with results for particles of various types and comparison to some historic methods. It is based on the reduction in the perimeter of object boundaries with morphological opening and closing using different disk sizes, or potentially a single size of about 5 – 10% of the overall shape dimension. Excerpt: Lipid and cholesterol are regarded as dangerous, but both are crucial for cells to function. Diet and obesity studies are confused, and it now seems we can even cure Type 2 diabetes. … Two-thirds of American adults are overweight or obese, a statistic that translates into an annual healthcare cost nationwide of $75 billion. Being fat raises blood pressure and causes cardiovascular disease and heart attacks, and it increases the chances of a stroke, cancer, and pulmonary disease. It is even related to cataracts forming in the eyes. This, like cancer, is one of the great problems society faces — and (also like cancer) it is something we try not to address. We rarely say people are fat. 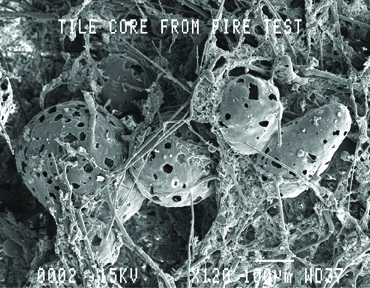 A scanning electron micrograph of ceiling tile core after a fire test, showing expanded perlite, mineral wool, and clay fused together.